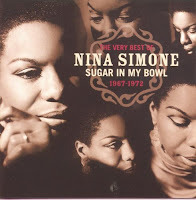 It is said that Nina Simone was one of the most difficult artists to work with during her time because she was an obsessive perfectionist. Her impeccable musical craftsmanship can be seen, felt and heard in her body of work, from her incredibly soulful and moving vocals, to the way each note dances with the words of each chorus. Nina's music has always been like soul food to me and always accompanies me during those days where I can use a little enchantment.